Also spelled Boehm, Böhme, Böhm or Behmen. German Protestant mystic and philosophical theologian. Boehme was born into a middle-class family at Alt Seidenberg, near Görlitz, in Germany. He received little in the way of formal education, and settled down as a shoemaker in Gorlitz in 1599. Despite the limitations of his early training, he was an avid student of scripture, theology, and the writings of Paracelsus (q.v. ), and devoted his spare time to the study of these subjects. He began to experience visions, and one day he had a powerful religious experience which was summed up in the phrase “In Yes and No all things consist.” From this dialectical revelation he gradually developed a system of mysticism, essentially Gnostic in character, incorporating the various streams of speculative thought of his day. His principle theme is that the dualistic principles of life originated from a single reality, and that the goal of mysticism is to reconcile these principles into a spiritual unity. Boehme was condemned and rejected by the religious authorities and the rabble of his day. His works are often rather difficult to follow, due in part to his lack of formal education, but they are nevertheless compelling, and charged with passionate spirituality. 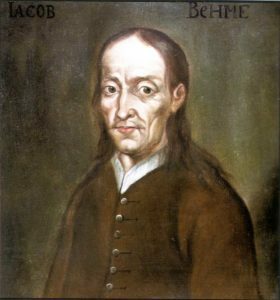 Despite his rejection during his own life, Boehme was highly influential on subsequent thinkers, including Nietzsche, Hegel, Schelling, Emmanuel Swedenborg, William Blake, and George Fox, founder of the Quakers. Boehme’s teachings were also influential in the development of high grade Freemasonry. In Boehme’s cosmology, the first person of the Trinity, God the Father, is identified with primal, unmanifested reality, Der Ungrund, “the Abyss,” nothingness which contains the potentiality of everything. The Abyss is characterized by a desire to reveal Himself, which He does through a process of divine introspection, or reflection. The second person of Boehme’s trinity, the Son, is identified with the desire of the Abyss to reveal Himself; and the third person, the Holy Spirit, is identified with the process of divine reflection. This process of reflection involves the making of a divine mirror, as it were, which Boehme calls “Virgin Wisdom” or Sophia. This Virgin Wisdom can be viewed as a fourth person of the Godhead. The images seen by God of His own potentialities in the mirror of Virgin Wisdom led to God’s desire to manifest the potentialities in reality– to engage in the process of Creation. His major works include Aurora (1612), The Three Principles (1619), The Threefold Life of Man (1620), Answers to the Forty Questions of the Soul (1620), Of the Incarnation of Christ (1620), The Great Six Points (1620), The Heavenly and Earthly Mystery (1620), Of the Last Times (1620), De Signatura Rerum (1621), The Four Complexions (1621), Of True Repentance (1622), Of True Resignation (1622), Of Regeneration (1622), A Book of Predestination and Election of God (1623), A Compendium of Repentance (1623), Mysterium Magnum (1623), A Table of the Principles (1624), Of the Supersensual Life (1624), Of the Two Testaments of Christ (1624), A Discourse between a Soul Hungry and Thirsty after the Fountain of Life and a Soul Enlightened (1624), Of 177 Theosophic Questions (1624), An Epitome of the Mysterium Magnum (1624), The Holy Weeks (1624), Of the Divine Revelation (1624), and Of the Last Judgement (1624).